A new supernatural horror series, The Fades revolves around a young man (Iain De Caestecker) who’s haunted by apocalyptic dreams that neither his therapist nor his best friend, Mac (Daniel Kaluuya), can explain. Worse still, Paul has started seeing the Fades (the spirits of the dead) all around him. The Fades can’t be seen, smelt, heard or touched by other humans as they’re what’s left of humans who’ve died but haven’t been accepted into Heaven. They become embittered and vengeful towards the human race and have found a way to break the barrier between the dead and the living. The first season of The Fades has been released on DVD. The two disc set includes all six episodes as well as interviews, outtakes, deleted scens and more. 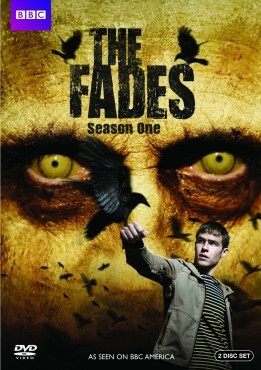 You can purchase The Fades: Season One or you can try to win a copy of here. To enter, you need to merely post a comment below. You can enter once per day. You can also follow us on Twitter and tweet “@tvseriesfinale Hope I win #TheFades on DVD! http://ow.ly/9q7ar” up to once per day. Guidelines: This giveaway is open to participants with a United States mailing address only. (International readers can enter if they have a friend in the States who can accept their prizes by mail.) Many may enter but one person will win. You must be 18 and older to enter and no purchase is necessary. Contest ends March 4, 2012. UPDATE: Congratulations to Julie Ross who won this DVD set in our contest. Thanks to everyone who played and we’ve got more contests coming! More about: The Fades, The Fades: canceled or renewed? I’d love to see this one. Brilliant show! Great atmosphere, solid characters and dialogue, and a few bold moves along the way. I hope they’re gearing up for series 2! Loved it! Hope there is a season 2! 3/2 Entry..I would like to sign up to win this. Thank you and keep up the good work on this site. 3/2/2012 entry. I’ve heard the name of the show,but don’t know anything about it.But the description sounds very interesting.It’s right up my alley of shows I love to watch!!! I haven’t seen the show, but have read some great things about the series! I would be thrilled to be able to win a copy and enjoy it like so many others are doing! They really should have advertised this somewhere, I just recorded Shaun of the dead in December on the network and saw a promo for this. I never saw any other advertisments on this anywhere. I think it was a little more than decent, and in the Graham Norton show, they don’t edit out the curses, but they did on this show for reason, I wonder why. I have never heard of this show but it looks interesting. Are there more then one season, and where can I watch it on television? Nope, the first one just wrapped up on the network and I guess they might air reruns at some point in time.